From rust bucket to show gem! 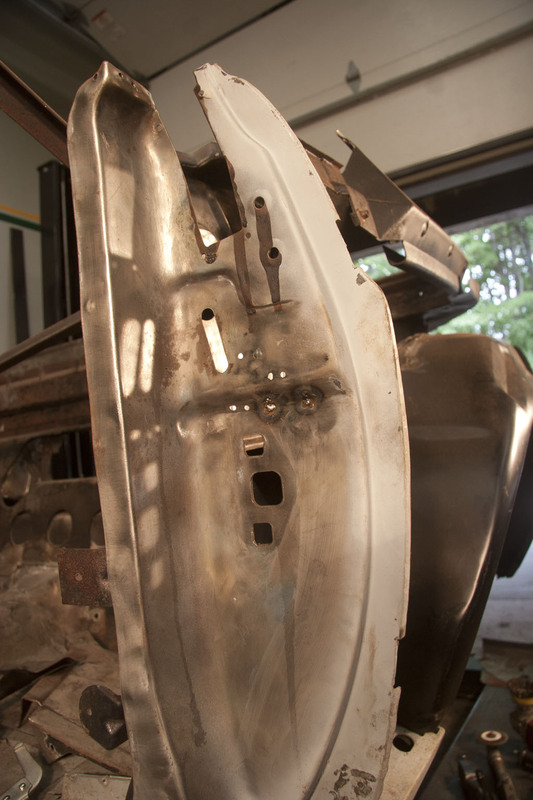 When I was cleaning up the surface rust inside the rear quarter area, I found some rust through holes in the Door jamb area on both sides. 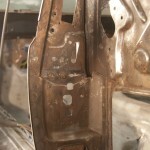 I had repaired the drivers side jamb back in July but I did not notice the rust through at that time. 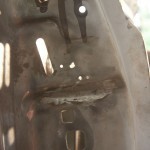 The holes on both the drivers, and passenger side were in the bend just above the door striker. My guess is that water would pool up there since that area is a sandwich of two metal parts spot welded together. 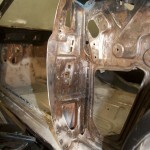 And as any old car owner knows, there was no such thing has rust proofing back then. 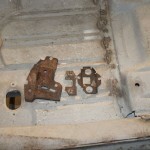 Before I welded up the rust holes, I took a drill bit that was larger than the rust area, and I cleaned out all the rust holes to get to good metal. Then using a brass plate as a backer, I welded up the holes. 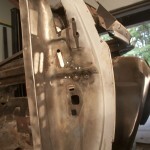 Any large areas were cut out and new metal was welded in. 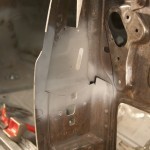 Once I was happy I ground everything down smooth, and painted it with weld through primer. Then I welded the assembly back to together. 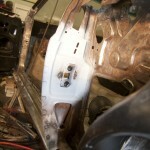 With the welding done in that area, I used Eastwoods internal frame sealer and sprayed in every area I could get into. I also sprayed extra in the sandwich area until it started running out the bottom to help coat any areas I may have missed. Next time I fabricate the mustang drip pans, which no one seems to reproduce. 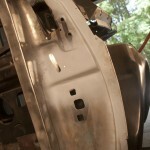 « Hey is that rust in your trunk. All the content on this site is copyright 2017, and all rights are reserved. No part of this site may be reproduced without the Authors explicit written permission.